Mark your assets with a unique DNA forensic solution, only visible under UV light, that links ownership of your property to your organisation on a central database. Labels and signs warn a thief that you are protected and acts as a major deterrent. 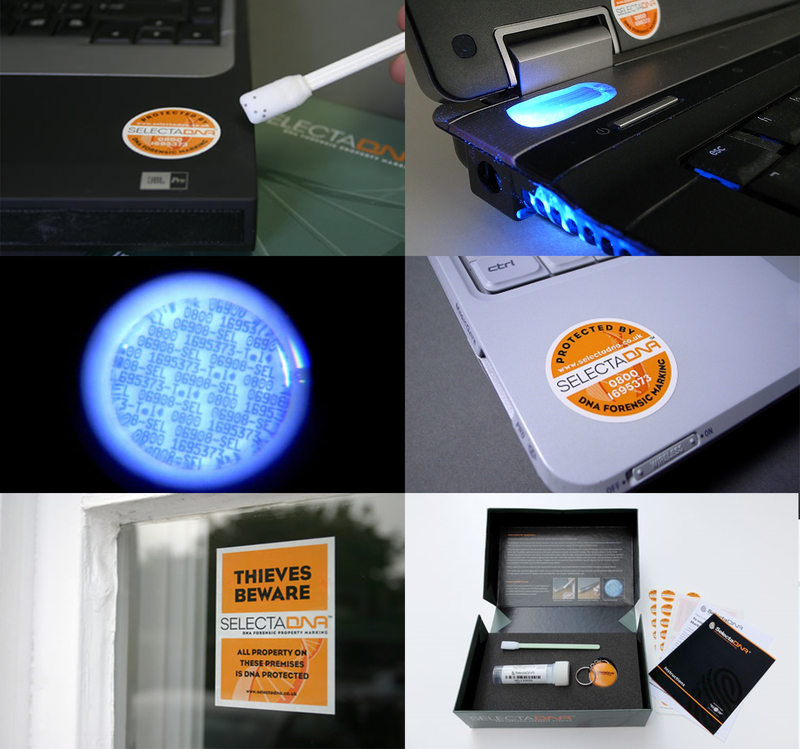 Has been proven in UK to reduce theft and burglaries by up to 83%. 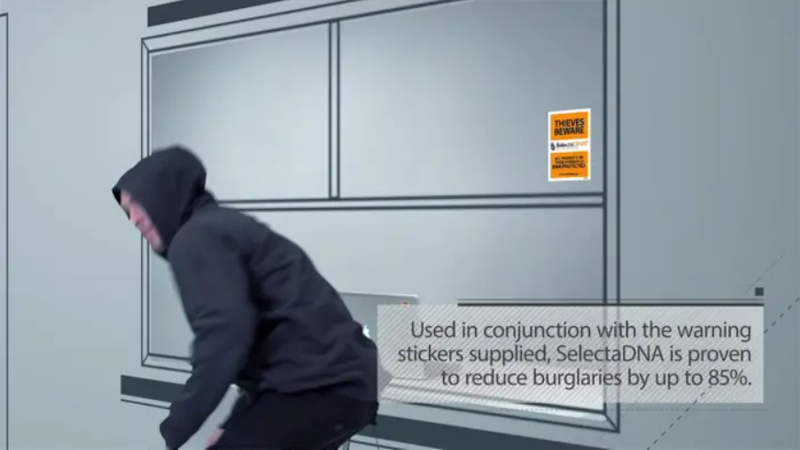 Used in conjunction with the warning and window stickers supplied, the system will help prevent the theft of expensive items in the home or workplace. SelectaDNA comes in a pot of adhesive to apply to any valuable items of property. Once applied, removal of all the SelectaDNA from a marked item is almost impossible, as it is difficult to locate (except with a UV lamp) and remnants of the DNA will remain in corners and uneven surfaces. The DNA code along with the customer’s details are held on our secure database, allowing the recovered property to be traced back to its rightful owner after analysis (even a tiny molecule of glue can be used to determine who the item really belongs to). As a further means of identification, each pot of SelectaDNA contains at least 1,000 tiny microdots, each bearing a code number that is unique to that customer. ….and any other items of value which might be at risk. The synthetic DNA used is totally secure. Unauthorised parties are unable to analyse or copy SelectaDNA due to its ‘Unique signature’ and ‘Key codes’. It is simple and quick to apply. Contains a UV tracer and Microdots (which contain our database number and unique customer code). Product options available for different applications. Details held on a secure database, as recommended by ACPO (Association of Chief Police Officers of UK). SelectaDNA is environmentally safe and is non-toxic. 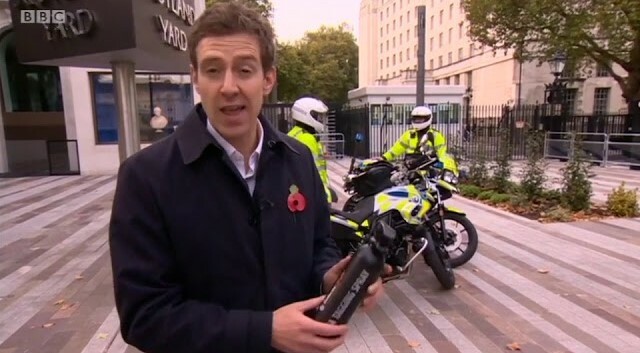 In this news feature, the BBC report on The Metropolitan Police’s deployment of a new DNA Tagging Spray as an innovative strategy to deal with the ongoing problem of moped theft, robberies, acid attacks and the anti-social riding of powered two-wheel vehicles. 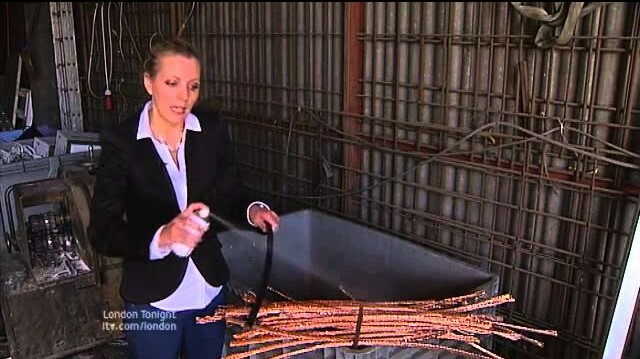 How SelectaDNA is able to help the metal thieves problem in London. 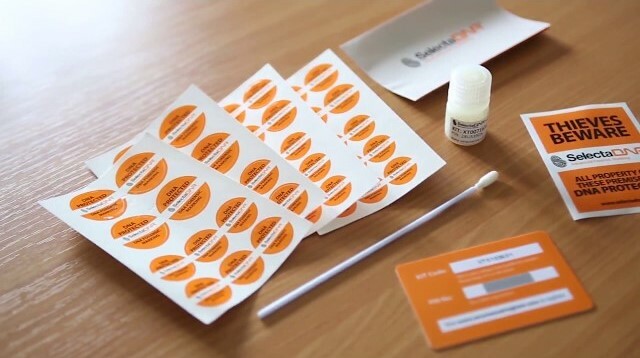 All kits contain unique DNA with microdots, warning labels, window stickers, application instructions, registration form and a UV light.